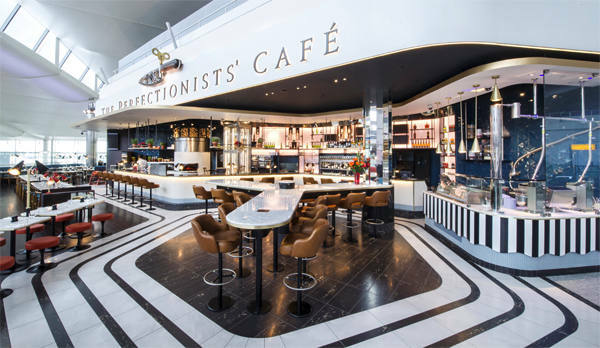 The Perfectionist Café is beautifully designed, offering a relaxed setting within The Queen’s Terminal which meets the travellers needs whether they have very little time to enjoy their meals or a little longer in which to linger. BSE 3D are proud to announce the installment of the first wood-burning pizza oven in the airport that features within the kitchen on visual display, as well as all mechanical service requirements fitted throughout the front and back of house areas. Surrounding their clients with a tranquil sensation and avoiding the general buzz that is quite often found at airports. The ventilation system allows stimulating aromas of the various foods to flow around the restaurant all the while providing a clean and fresh space in which guests can enjoy a moment of serenity in the spaces elegantly designed by Aphrodite Krasser. The innovation displayed in this project stands as a beacon, symbolising how safety regulations, intricately fine details and requirements can all be achieved and come together to achieve a first class restaurant which really stands as merit to all practices of the Engineering industry. Click here to read an article about this project. For more information on the services we provide please contact us by filling in the form below.